Stampless folded cover docketed: "John Penberton, New London, 6 March 1769. 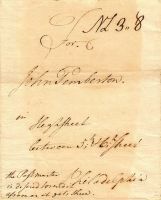 Cover notation:"the Postmaster is desired to send it as soon as it gets there". Rated in brown ink "(NL 3,,8) for the 200-300 mile distance.